Photo Credit: squidoo.com/jellojigglers - All rights reserved. TIP: You could make ice cubes too! 1. Stir boiling water into a dry gelatin mix in large bowl at least 3 minutes, until completely dissolved. Pour into clean Mega Bloks. 2. Refrigerate Jello for at least 3 hours or until firm. 3. Dip bottom of Mega Blok in warm water for 15 seconds. Lift Jello from Mega Blok. Store Jello in a tightly covered container in the refrigerator. 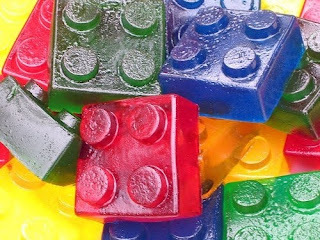 Alex Summersell posted: And you might want to bleach those blocks before you use them for a jello mold! Kid germs you know. Laura Robran posted: wow, what a great idea for children's parties. I love this. Michelle Dabomb Brown posted: Also non-flavored cooking spray helps to release the jello. Thinking this might be what I take to the grad party!